I have the best time reading Fantasy and Science Fiction when I get I book I simply can’t put down. In a world of superpowers, Felix has an unusual power. Anything he owns, he can modify, but only if he has enough points. Since he has few points, he works as a fast food manager. A super villain has captured the city and allowed slavery, as Felix discovers when he tries to buy bismuth to turn to gold and ends up with three, almost-tortured-to-death super women. Turning down their powers earns him enough points to heal them. 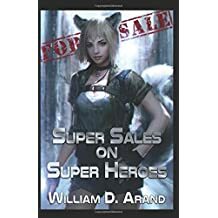 That gets him looking for Super Sales on Super Heroes (ebook from William D. Arand). Felix is basically a nice guy but he keeps buying slaves for points and pawn shops to turn used goods into new. That brings him to the notice of the league of super heroes, who hate slavery despite Felix not abusing his slaves (he even gives some of them new powers as he gets points.) Impossible to put down. David Mealing starts the first book of what promises to be a tremendous trilogy in a world of three types of magic. Erris is a full binder, able to tap ley lines of energy to give herself extra talents like speed and strength or healing. She is also a superb taction and has risen to general in charge of the defense of the colony of New Sarresant. Arak'Jur is guardian for a tribe in a wilderness filled with horrible monsters. Killing one of the monsters gives the guardian its powrs and abilities. Together with the Shaman of the tribe who predicts monster attacks, he defends his tribe. The third type of magic involves interaction with beings called kaas who can change emotions of those around them. Sarine, who we meet invisibly sketching the nobles of New Sarresant, has all three abilities There have been a number of cycles in which two of each type of magic ascent to a higher plane to fight to determine the path for the next cycle, and Reyne d’Agarre is using revolution to increase his abilities. At the same time Sarresant’s enemy empire Gand has sent a new army to attack the city. At stake is the Soul of the World( paper from Orbit). There’s an exciting ending to this first book, but it leaves many questions. Murder mysteries are rare in mediaeval fantasy because life is too cheap. Rem, who may have been an aristocrat is a newcomer to Yenara. He ends up in the dungeon after a bar brawl and talks himself into a job as watchman. Torval, the dwarf who is showing him the ropes, ends up finding his dead partner on The Fifth Ward: First Watch (paper from Orbit) for Rem. Dale Lucas tells a rambunctious tale that sends the two watchmen into the worst parts of Yanara, fighting orcs and dealing with elves. The case is far bigger that either expected and leads to villainy that is actually illegal in the city. I can’t wait for the next case. Charles Stross’s Laundry Files tales were created as an odd mix about a Len Deighton type low-ranked agent fights Lovecraftian monsters. The Seventh case, The Delirium Brief (hard from Tor) brings a villain from a previous tale, Reverend Schiller who was possessed by the sleeper in the Pyramid on another world. This time he wants to use his parasites to take over the top politicians and media persons to control England. The Laundry has come to public attention because of the Elf invasion in The Nightmare Stacks (paper) was too public. Even with Bob Howard having to give an interview on the BBC, the PM (as incompetent as the present real one) closes down the Laundry on the advice of the Reverend and only by bringing in old adversaries, does the remnants of the Laundry have a chance of stopping him. Fans will be overwhelmed. Others should find The Atrocity Archives (paper) to start this fun series. The Witch Who Came in from the Cold (hard from Serial Box) was originally sold on Amazon as a linked serial. Lindsay Smith, Max Gladstone, Cassandra Rose Clarke, Ian Tregillis, and Michael Swanwick attempt to capture the mixture of spy and magic that make the Laundry files so readable. In the winter of 1970 Prague, the CIA and the KGB fight from opposing sides, while the sorcerers of the Fire fight the sorcerers of the Ice with sorcerers on both sides of the Cold War. At the heart of the sorcerous fight is control of elementals found in human hosts around the world. Gabriel Pritchard followed a spy into the wrong meeting, interrupted a major sorcery and ended up with a elemental stuffed into his head. On the Spy side there’s a defecting Russian scientist who, it turns out, is a host. At the same time the Golem of Prague has been set free and is trying to murder Gabe. Fun, but the spy parts are routine and the magical parts are too dark. Kalayna Price has a new tale of grave witch Alex Craft. A necromancer is killing people and putting their souls into dead bodies, promising a Grave Ransom (paper from ACE) to the animated corpses if they will rob and steal for him. Alex is soon set up as bait for someone with powerful magic that she can barely defeat, even with the help of her friends. This is the first Alex Craft tale I’ve read and I had no problems keeping track. The rest of the series is on my want list. Carrie Vaughn tells of a small groups of settlements on the California Coast after civilization fell with a whimper. The coastal road has birth control implants in alll women and expects them to earn a banner before having a child. Enid and her partner Thomas are sent to investigate a rare murder. The victim was very asocial and thought to be Bannerless (paper from Mariner Books) but he wasn’t. This is a good look at the problems of small town psychology and how personal interactions can easily lead to major problems. Excellent. Edward Willett tells of a city shaped like a spaceship out of fifties sf. Its five hundred years old and under it is a trash heap of the Middens. Two of the The Cityborn (hard from Daw)are a bit special Danyl was kidnaped from a special ward and another like him murdered. He was raised in the Middens as part of a plan to free the city from its captain and first officer. Alania, raised in luxury was out of the nursery when Danyl was taken and is being moved to the first officer’s quarters on her twentieth birthday when she survives an assassination attempt by falling down a garbage chute to the Middens. Luck brings the two together, but the first officer will stop at nothing to capture them. So they run across a poison-filled, decayed area with no idea of why they are important. Exciting. In a conquered land Voada Paorach is the wife of the local native leader. The Mundoa have ruled most of Albann (think England under the Romans) for a century. The Mundoan Emperor sends a general to conquer the rest of the Island finally but the Cateni have those among them who can draw magic from the spirits of older magic users, Draoi.. Voada would have done nothing about the spirit that visits her until her husband dies, and the Mundoan leader sends her children into slavery and leaves her for dead. In A Fading Sun (paper from DAW), Stephen Leigh tells how Voada, led by the spirit, crosses into Cateni land to train how to use the spirit powers, and then how she leads a rebellion to free her people. And how her anger and one of the ancient spirits she uses, pushes her beyond her limits. Interesting. Sarah Gailey has a fun tale of an alternate Grants term in America in which hippo’s were introduced to the Louisiana Bayou area for food. Winslow Houndstooth and his crew have been hired to remove feral hippos from a lagoon where Mr. Travers, Winslow archenemy has set up gambling river boats. After they set bombs off Winslow and crew have to navigate a River of Teeth (ebook from Tor). This is definitely the Wild West with Hippos and as much fun as it sounds. 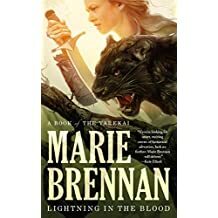 Marie Brennan continues her tale of Ree, an Archeron called in the first book to solve a problem and ends up helping revolution. There’s Lightning in the Blood (ebook from Tor) and bandits in the hills when she meets some wandering Korenat, recovering from an attack. So she joins the forces hunting the bandits and is led to them by a magical jaguar.Fun. Tad Williams starts a trilogy in Osten Ard, the same world he started his career with in 1988. It’s been three decades since the events of Memory, Sorrow, and Thorn (paper) and the main character from that period are grandparents. Simon, now high king rules a quiet kingdom. His son died leaving two children, Morgan who is almost adult and his young sister Lilia. . The immortal Queen of the Norns has awakened and is plotting to destroy all the mortals. She sends a a small expedition to capture a live dragon for its blood with a half-blood Norn Nezeru. They are joined by a mortal guide Jarnulf who sends a message to the kingdom about The Witchwood Crown (hard from DAW) Morgan is sent on an expedition with a sick Sithi (non-mortal) messanger who had been ambushed on her way to the kingdom. There’s a lot more coming in this long trilogy the Last King of Osten Ard and it promises to be exciting. Andrew Neil Gray; and J.S. Herbison tell of space ship hackers Saga and her husband Michel who are hired to break into the moth-balled Martian Queen still in orbit between Earth and Mars. They didn’t expect that the ship was The Ghost Line (ebook from Tor) and quite dangerous, something the person who hired them already knew. It’s an interesting tale, but I didn’t buy the reasons for the ghosts. The Science Fiction Society will have its next meeting on July 14th 2017. A panel of members who have read the Hugo Nominations for this year will discuss the tales. The meeting starts at 8 p.m. at International House on the University of Pennsylvania Campus. .As usual guests are welcome.